Although I originally wrote this article in March 2014, I regularly update it with new information as it arises. The popularity and education of prenatal massage has increased significantly over the past few decades. In tribal cultures, prenatal and labour support massage was common. Anthropologist George Engelmann documented these techniques in the mid 1880’s; however the first documentation of labour massage was in 15th century England. It was common practice for midwives to use massage while the mother was in labour to make her more comfortable and to relieve pain. The elder women of the Nama Hottentot tribe of South Africa give massage treatments to the pregnant women of the tribe several times a week to prepare for the upcoming childbirth. In Uganda, pregnant mothers receive massage daily in an effort to make their muscles and joints supple for an easier labour and delivery. Women in tribal societies resume their normal everyday activities almost immediately after giving birth. Among the natural methods used to restore strength and decrease postpartum depression in the new mum, the most important and widely accepted tradition is massage. In our medically advanced society, massage can often be over-looked as an important part of pregnancy health care. However, this tried and tested tradition is one of the oldest forms of the healing arts and has been used for thousands of years in almost every culture. Every pregnant woman deserves some pampering and massage is a wonderful way to reduce stress and promote general wellbeing. Massage can be received during all three trimesters of your pregnancy for both normal and high risk pregnancies. With the exciting news that you are pregnant, your body is about to undergo stress-producing changes. Some of the consequences of these changes can leave a woman feeling sore, tired and uncomfortable. Massage is therefore a great way to relieve this discomfort through the positive effects of soft tissue manipulation. Pregnancy Massage therapy helps the body adjust to accommodate the life growing within. It can assist in reducing stress, encourage relaxation and prepare muscles and joints for childbirth. Not only can this be a treat for you, but a much needed therapy to ease some of the aches and pains experienced during pregnancy. It has been claimed that during the first trimester, pregnant women should not have massage as it may cause miscarriage, however if the pregnant woman is healthy and proper guidelines for working with pregnant women are followed, then there is absolutely no medical evidence to support that a massage could harm the pregnancy or cause miscarriage. Most times this myth is circulated by therapists who should not be doing pregnancy massage as they are obviously not qualified to do so and should refer that client to a remedial massage therapist who specialises in pregnancy massage. They know the anatomy and physiology of a pregnant woman. They know what the contraindications are for massage and they know when something is not quite right. Be cautious that just because a brochure or a dayspa offers pregnancy massage, it doesn’t always mean that they are qualified to do so. Probably the main reason for not getting massage in the first three months is more about comfort as it may trigger dizziness or increase your morning sickness – on the other hand it may eliminate these symptoms. You won’t know until you try it and then you can let your therapist know if you start to feel uncomfortable and adjustments can be made or you can just stop the treatment. Remember, there is no danger, just the potential to be uncomfortable. It is essential to ask any questions or raise any concerns you may have to your therapist at any time during the treatment. A trained pregnancy massage therapist will safely and effectively answer any questions you may have about having a massage during any stage of your pregnancy. A professional pregnancy massage will always start with a minimum fifteen minute consultation prior to actually having a massage each and every time you attend. You should be asked specific questions about the progress of your pregnancy, your current condition, your antenatal appointments and specific areas of discomfort and range of motion checks. Pregnancy Massage Specialists do not recommend the tables with the hole where the belly hangs down, as this puts so much more pressure on the sacrum and lower back and can strain the ligaments around the uterus and pelvis, not to mention your growing breasts, which may be tender or uncomfortable. Just imagine all that weight of your baby in your womb, just hanging down with the force of gravity – while your therapist is also then creating more pressure during the massage with the massage techniques (or not effectively working through this area so they don’t put more pressure there), so then your glutes (bottom) muscles are tensing trying to overcompensate for the pressure created in your back. 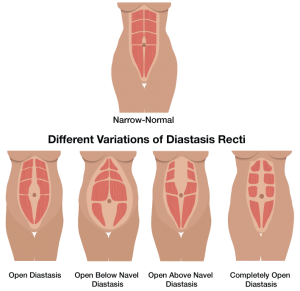 What also happens is the weight of your baby, placenta and uterus are creating a lot of pressure through the rectus abdominis, and in some cases this can cause Diastasis Recti (separation of the abdominal muscles). This condition can lead to more lower back pain, constipation, urine leaking and in extreme cases hernia and ongoing core / pelvic floor problems during the postpartum period. Click on the image for more details on “diastasis recti” by Physiotherapist Laura Boston. Lying in the prone position (face down) can also create problems with the position of your baby, and it is important to encourage baby into the Optimal Foetal Position for labour and birth, rather than do things that will inhibit or hinder this. In the prone position pressure is placed on the lumbar and pelvic regions as well as the uterine ligaments that can change the alignment of the pelvis. This can also lead to more pain because the sacroiliac joints become rotated and the sacrouterine ligaments are pulled down with the weight, creating a hyperlordosis of the spine, which will create more pain and also affect the alignment of the pelvis. The best position during pregnancy massage is in a side-lying position, with your top leg at a 90 degree angle supported by a bolster under your leg and knees stabilising the hip joint, along with your top foot also being supported, not just hanging down at the edge of the bolster. 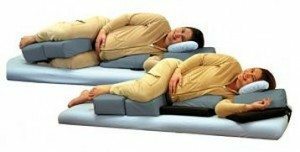 Support cushions will also be used to stabilise your body to prevent you from rocking or rolling from side to side. 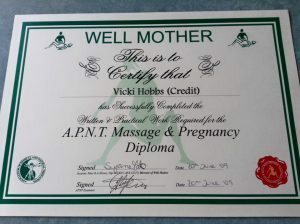 I am a qualified Remedial Massage Therapist specialising in pregnancy, labour and postpartum massage. 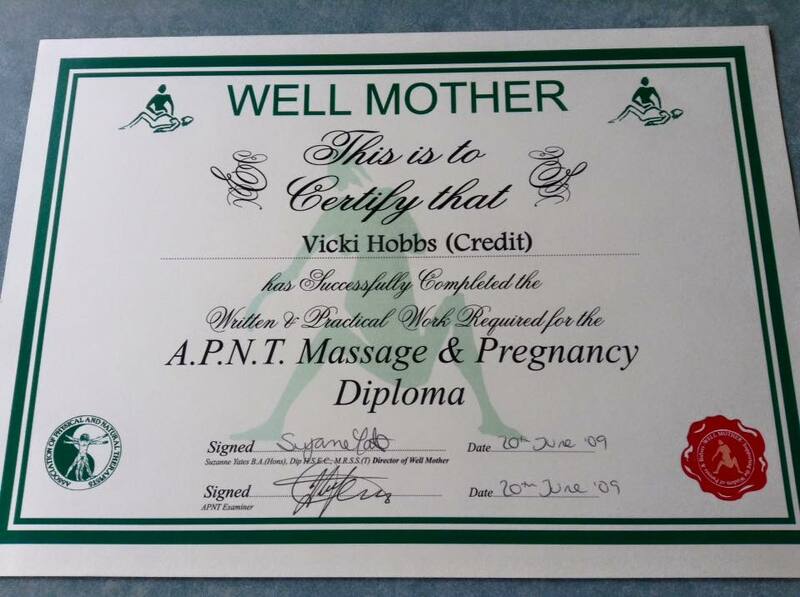 This means that I am a highly trained pregnancy massage specialist having completed the Diploma in Pregnancy Massage course in 2013 with Pregnancy Massage Australia. This training is an advanced level of training for pregnancy massage, but also specialising in working with high risk pregnancy clients such as those with pre-eclampsia and other conditions such as pubis symphysis separation, pelvic girdle pain, lower back and hip pain, injuries and other pregnancy related dysfunctions. I have expert knowledge and training of the anatomy and physiology of the pregnant body, stretching during pregnancy, labour position techniques, acupressure and massage instruction for your partner. I am also a Certified Birthing Coach (Doula) and Childbirth Educator and I conduct regular “Back to Basics Birthing” workshops for pregnant women. In addition to this, my insurance company specifically covers me for pregnancy massage, not just remedial massage, which further ensures that all strict training criteria and guidelines have been met for your own peace of mind. As with most therapies, there are always precautions involved with receiving treatment during pregnancy, however pregnancy massage (when performed by a trained and experienced therapist) is a safe procedure with benefits far outweighing the risks. For your own peace of mind, you can even discuss with your medical practitioner or obstetrician of your intention to have a pregnancy massage, and they will advise you if they feel that you should not do so for whatever reason. Prepares the muscles and tissues used during labour and birth. Many of the problems that arise during pregnancy are due to muscle strain, weakness and poor posture. Proper exercise and appropriate stretching will increase your energy, strengthen the muscles most strained during pregnancy and labour, stimulate circulation and increase flexibility in the joints. 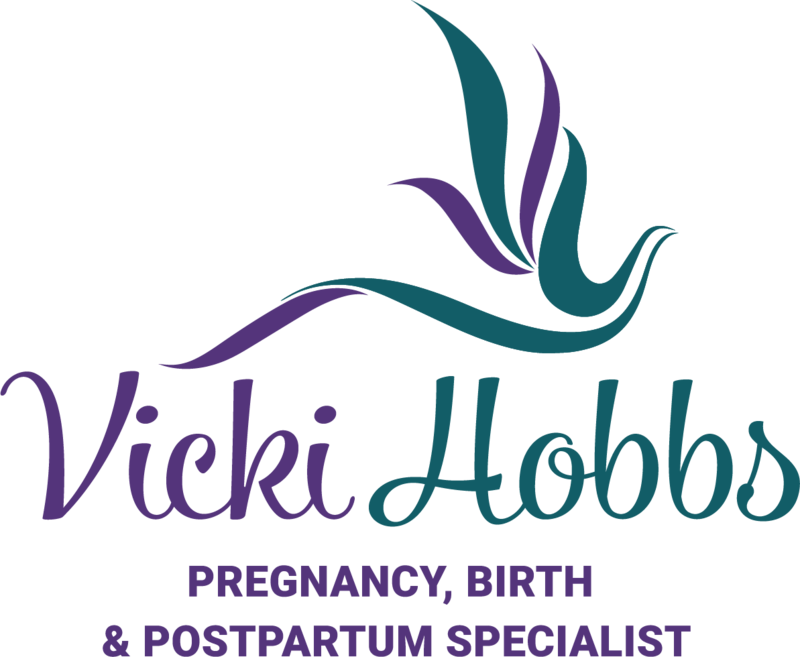 “I would recommend Vicki Hobbs to anybody. I first heard about her in an advertisement in the local magazine Offspring. I was 24 weeks pregnant, working 25-35 hours a week in a busy café and was starting to feel a little tense in my lower back. I decided to treat myself to a massage but I was a little nervous about having a massage while pregnant so I did some reading on the internet and Facebook which helped me to make a decision. Vicki is very professional and welcoming and I felt comfortable in her abilities almost instantly. The bodyCushion that she uses is so comfortable and supportive. Pregnancy massage was such a great way for me to relax (body and mind) before the arrival of my baby. I continued to work right up to 36 weeks (3 weeks before baby was born) having a massage every 2 weeks or so definitely helped me stay very active during my pregnancy especially towards the end. I look forward to going back for a massage without my big belly!